As the holiday shopping season looms large over the rest of the year, some retailers may be terrified to realize just how vital a role pricing plays in influencing customers’ purchase decisions. More so than ever, holiday sales like Black Friday and Cyber Monday incite consumers to become more savvy in hunting down deals. When it comes to pricing, however, a few small adjustments could decide whether you wind up with a trick or a treat this fall. In fact, it’s so scary easy to update your approach to pricing that there’s no reason your customers shouldn’t be howling in delight this Halloween. Here are a few pricing tricks to give your competition a fright this season. Presentation: Believe it or not, how your prices look can significantly affect your sales. Having dollar signs or decimal points can alter the way consumers perceive the value of your product and how likely they are to act. Even if it sounds silly, consider testing alternative presentations to see what works best for you. Charm pricing: Another aspect of price appearance, the concept of charm pricing refers to items with prices ending in “9,” as these have been proven to be more psychologically appealing to consumers. For instance, an item priced at $499 is far more likely to sell than if it had been listed for $500, despite the negligible difference. In addition, the same applies to prices that end in other odd numbers, such as $487. A sense of urgency: Ever turned on an infomercial only to see that this is a limited-time deal? Well, you too can tap into consumers’ terror of losing the best deal. However you choose to communicate this message, the holiday shopping season may actually be the best time to use this strategy. Consumers are already keyed up to spend more money than usual and are extra careful about how they spend it. Urgency can give them the push they need to actually make that purchase decision. A/B testing: By far one of the most essential tools your business needs to be taking advantage of is automated pricing. The ability for pricing to shift at will based on a pre-determined data set is invaluable, and A/B testing — in which you alternate between two distinct price points — can help you discover what your customers truly want from your pricing. Set up an automated A/B test for a finite period, and then go with what works. Simple. BOGO (Buy One, Get One): There’s a reason why BOGOs are perhaps one of the most popular examples of psychological pricing. While the deal in question is essentially the same as marketing items at half-price, the perception here is that consumers are getting something for free, and they are therefore much more likely to take a chance on a new product or impulse-buy something they ordinarily would not have. Anchor pricing: Context is everything when it comes to pricing, and you want to shock consumers with how impressive your pricing is. So positioning the cost of your products next to a higher alternative — perhaps even the original retail price — can help shape their perception in a positive light. This technique is known as anchor pricing or anchoring, and few strategies are more effective in connecting with customers. Comparison pricing: We’ve all seen those commercials wherein a product is directly compared to its competitors, right? With the holiday season on the horizon, consumers are already likely assessing their options when it comes to the various products they’re looking to buy for themselves and others. Comparison pricing then pinpoints the value proposition in your product both by highlighting the lower prices you have to offer and why your items are superior in quality as well. Decoy pricing: Having a variety of options is always a good rule of thumb, since some consumers may be willing to pay less for a simpler version of the same product. However, decoy pricing can punch this approach up even more. In this case, one item — perhaps the middle-priced option of three — is priced closer to the more premium edition. In this way, consumers are more likely to simply opt for the higher-priced choice because there’s only a marginal price difference. In short, decoy prices exist to push consumers towards a better item or to create the illusion that the remaining options are a better deal in comparison. Bundling: Even if you have several products or services that might not individually win over consumers, you’d be surprised how often they’re coerced into buying a bundle of related products instead. By relying on a cumulative price for a number of items (regardless of the reality of the discount), you’ll create the perception that there is an inherent savings in buying in “bulk” this way. 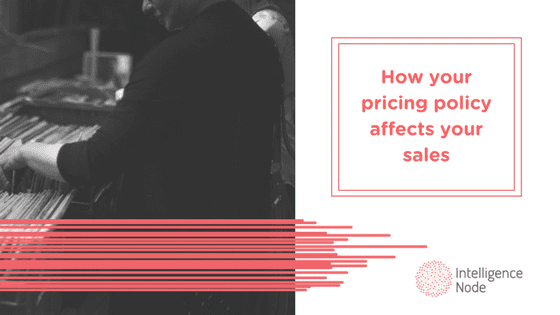 Loss leader pricing: Whenever you price your products, it’s always a delicate balancing act between making a profit and giving consumers the best possible deal you can. Loss leader pricing, for example, is any instance wherein you lower the price of an item below what it cost (i.e., taking a loss) because you’re banking on customers adding additional items to their cart. It may appear to be a risky move, but you’d be surprised how often this approach actually proves effective in bolstering your company’s bottom line. While Halloween might seem a bit early to give your pricing an overhaul, holiday shopping is starting sooner every year, and your business simply cannot afford to wait around for your competitors to sink their teeth in first. The above strategies can help you creep into action this season and make the most of all the hair-raising profits your business may be able to claim. After all, there’s little reason you should be haunted by a failure to effectively prepare for what is widely considered the most horrifically busy time of the year in retail. Rather, cast your sales spell now while you have the chance.